Mohali, April 5: A day after Rajasthan Royals batsman Jos Buttler said that the rules of 'Mankading' needed clarity, Kings XI Punjab skipper R. Ashwin reiterated his decision to 'Mankad' Buttler, adding that his 'conscience was clear'. "There is nothing to defend," Ashwin said on Thursday. "As I said in the press conference that day, it happened instinctively, it was not a plan that 'Buttler will go outside (the crease) and I have to get him'. Although he did do it four or five times. They didn't want to take risks against my bowling that day, so what they were doing was pushing the ball on the leg side and trying to take twos. What Is Mankading? 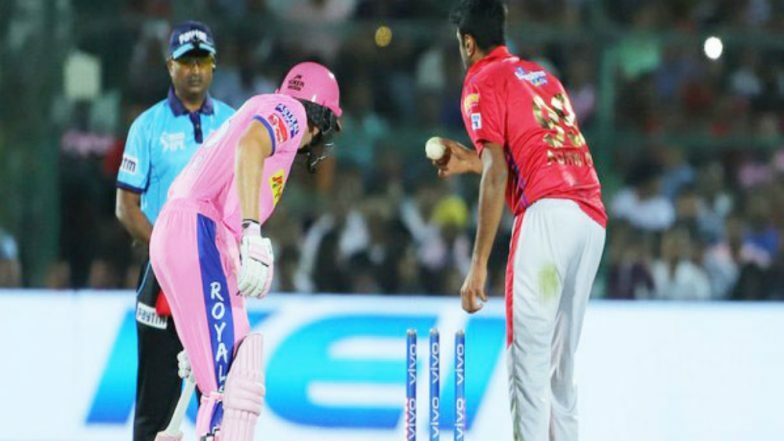 All About The Mankad Way Of Dismissal That Was Used By R Ashwin to Run Out Jos Buttler In IPL 2019. "I saw that he'd done it (backing up too far) four or five times, and it's there in the rules that if the batsman goes out of his crease, you can run him out. It's the batsman's responsibility to stay behind the crease." Rajasthan Royals' Jos Buttler Opens Up on 'Mankading' Controversy, Says It Needs Clarity. Ashwin said that those who know the spinner would never say that he would do something illegal. "Those who know me well know that I will never do something illegal. You can't say that 'Ashwin is a villain because of this' as that is not my character trait. You don't tell someone who has hit a bowler for 30 runs in an over that he is not a good person. He will hit the bowler, that's part of the game. "And whatever rule is there in the game, I took advantage of that. I'm not denying I did that, but that's the rule. If someone doesn't like it, and you think it doesn't fit into 'sportsmanship' in cricket, then you should remove the rule. As long as the rule is there see our (bowlers') foot can't go beyond the line. Even the line belongs to the batsman. And in this rule, the only thing is the bat should stay in the crease. The batsman still gets two yards, he can be outside the crease, with his bat inside." England batsman Buttler was 'Mankaded' by Ashwin at a crucial moment in the match that Rajasthan went on to lose. The manner of the dismissal created ripples across the cricketing fraternity and beyond, with many former greats of the game lambasting the Indian off-spinner for breaching the 'spirit of the game'. Ashwin said the bowling community is always victimised in such cases. "The only factor which sort of makes me uncomfortable is how the bowling community is being victimised," Ashwin was quoted as saying by India Today. "Why isn't a bowler allowed to bowl a no-ball as a repeat offender? If I have to bowl the ball within the 22 yards, why is the batsman allowed to steal a few yards on that? I am sure there have been debates about how far he was down the ground. But, I think even one rupee is still a theft."